Tonight I ran my "Raiders of the Lost Ark" run. 6 miles heading north of my home and running through the neighborhood of Circle G Ranches. I was working on keeping my pace as close to 10 minutes per mile, as I could. The first two miles came in at 10:14 and 10:32. I walked a bit to eat half a GU. I wanted to see if that would kick in and let me get to the 10 mpm goal. The 3rd and 4th miles came in at 11:42 and 11:52. Not, so good. Then I had the rest of the GU and miles 5 and 6 were at 10:55 and 10:42. A bit better. But, all in all a good run that Harrison Ford would be proud of. Now, why do I call it the "Raiders of the Lost Ark" run? Because I run past this home (click on it last, it may not let you come back)and it's the home of this guy. It's for sale, so if you're interested let me know. My Run - click on the map and change it to satelitte photo to see if you can find the home. Hint, it's near the 2 mile mark. Google it. 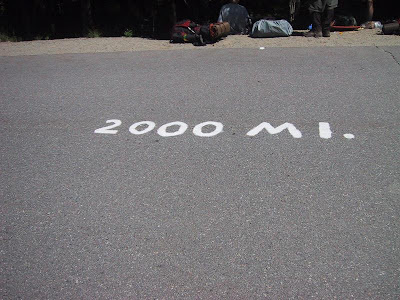 Reaching 2000 miles is a big deal. In a car. Or on foot. 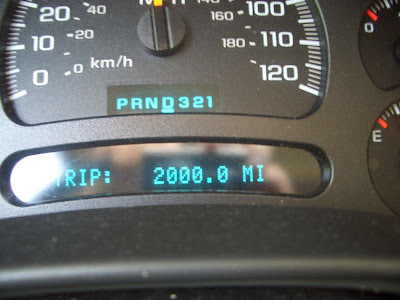 Somewhere on Lisbon Drive in Chandler, AZ I reached 2000 miles for my running career. 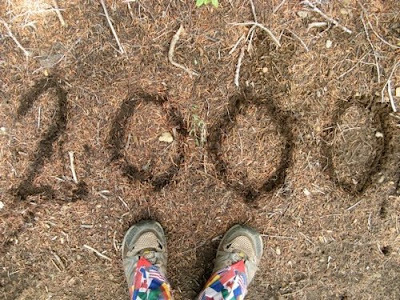 My first mile was back on August 2, 2006. I did 2 miles. That's 65 miles a month for 31 months. What are you doing on September 6th? I suggest you visit the mining town of Jerome in the mountains of Arizona. Then with 200 of your closest friends you can run 4.6 miles up the mountain to a finish line and food. In 2008, Zachary Thomas did it in a course record of 29:14. Some take an hour and a half. The first photo is from the one mile mark looking back at the start. If you look closely at the second photo, you'll see a line of runners proceeding up the dirt trail. The third photo is right before the finish line. Jerome is called the 'Most Vertical City in America' and now you can see why. Now, this 2009 will be my first year running this race and I was wondering how you get back down. I looked in the race photos and I don't see the bus. But, I do see other photos of people heading down this road on foot. Maybe the bus is around the corner. Or maybe you'll have to run the 4.6 miles back down the trail as a cool down. If you like these photos, check out Megan's website. She's a pro that takes pics at many of the ARR races. What's more amazing than the lack of a bus, is that she'll sell you the pictures dirt cheap. So cheap, you'll even want to buy pictures of strangers. 2008 Jerome Hill Climb Results. I just renewed my membership to the Arizona Road Racers. ARR is the running club for the greater Phoenix area. I am a member of SAR - Southern Arizona Roadrunners too. They are out of Tucson, an hour 20 minutes south of my home. I joined as a Benefactor. It's three times the cost of a normal membership. But, I get to run in 10 races for free. The Christiansen Trail Run, The Desert Classic 2 miler, All five of the Summer Series races, The Jerome Hill Climb, The South Mountain Classic 5k and the Mazatzals (mad as hell) Trail Run in Sunflower, AZ. Papago Park 5k on May 23. Reach 11 Park 5k on June 14. Rio Vista Four on the Fourth on July 4. Kiwanis Park 5k on July 18. "Join the ARR for the 39th Annual Jerome Hill Climb. This unique event is a 4.6 mile uphill run on paved and dirt roads that begins at the Jerome Historical Museum and passes through historic downtown Jerome before finishing on a nearby mountain top." 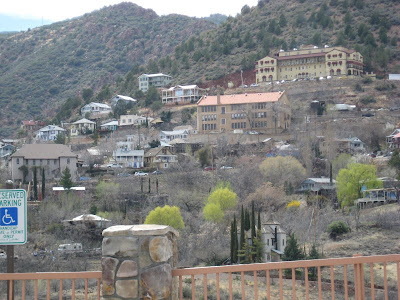 Here's a view of Jerome, "America's Most Vertical City". Yeah, we start near the bottom and finish way up high. Remember I am reading 48 books this year before my 48th birthday. This is book 16. The second book in the rabbit series and probably the last one I read. Updike's books are kind of depressing. In the first book, Rabbit, Run you read as the main character Rabbit, deals with his faultering marriage and dead end life. So, he runs. In this book it's his wifes turn to run. I had heard that John Updike was a world class author and he recently passed away, so I wanted to read some of his works. I've read two, so now I'm done. Does he venture into other subjects? Maybe I just need to get away from the rabbit series. Time for some Dirty Six! How about this for a race? I'm thinking about signing up and it's close to home. Katie sent me my prizes for winning the Biggest Loser Fantasy League and for the Half Marathon Challenge. My wife collects disney pins on the small quilt she made, so I added the two pins to it. You can click on the photo to see the pins closer. And I also got some spices and seasoning from Maryland. It was the annual St. Patrick's 8k (4.8 miles) and 1 mile races in Kiwanis Park. I've always wanted to do a one mile race and I figured this was my time. I tapered for three days. My legs were tired and I planned to take two days off, but it turned into three. Over 200 runners lined up for the longer race and 39 of us lined up across the street for the mile. It was about half kids and half adults. I figured I could finish in the top 4 or 5. Usually there's some fast kids and one or two fast adults. Luckily, today there was only one fast kid. I got to be the fast adult. Before the start of the race, one dad was giving instructions to two young men next to me. Finally, the one kid looked at me and said, "I'll just follow him." That was the nine year old that lead the whole race. I was right behind and had to give him directions to turn right, go under the bridge, keep the lake on your left and finally to turn right again. Yeah, I was tempted to have him run around the lake again. The finish is up a hill and then a sharp right turn into the picnic area. I tried to kick it, but my tank was empty and his wasn't. His buddy, the 7 year old was right on my tail the whole way. We finished one, two, three. An 8:10 mile is my best. I think I did an 8:20 first mile at the Goodyear 5k. After the race I got to talk with the kids. For polite and nice. I let him know I didn't let him win. If I could have passed him, I would have. My garmin battery was low, so I didn't get to see my pace during the race. I just tried to keep up with the fast kid. After our race, I got to watch the longer race. It's entirely inside the park. Around the lake, on the canal and some park road. It was nice that they went one way and the milers went the other. I stuck around and helped with the kiddie dash. The 7 year old that finished third in the mile, won his age group in the KD. The 9 year old finished 4th. Plenty of fruit, cookies and water for the runners. They even had some green beer. They gave out awards to the top three in all age groups for the long run and medals to the top male and female in the mile. I did win my AG (three old guys), but no medal for second place overall. I am now putting my race reports on Arizona Foot Races. It's a blog that lists all Arizona races from Lake Powell to the Mexican border with race reports from lots of different runners. It's new and you can put your race reports there too. That is, if you run any Arizona races. I started this blog and April is the first month. But, I'm posting older race reports. So, if you have any race reports, let me know. I can copy and paste them from your blog to AFR. Check it out, I think it'll be pretty cool. My son had to go to downtown Chandler for a Japanese Swordsmenship class. It was his first time driving down there, so I told him I would go with him and run home. I don't get to do too many runs that aren't a loop, so this would be fun. Except, after running two races over the weekend and running yesterday and again tonight I had tired legs. Four runs in five days was a bit much. Yesterday I ran 3.4 miles in 40.06 (11:36 pace). I got to run the Indian Bend Wash, almost got run over by some SF Giant minor leaguers in a van(they were in uniform) and almost hit by a golf ball as I ran past the golf course. The top map is of that run. Tonights run was 4.3 miles in 50.57 (11:41 pace). I started my run right where the Ostrich Festival finish line was. The hardest part of the run was going past all the great smelling restaurants. In and Out Burger was unbelievable. I almost stopped. So, what's unusual about the bicycle below? You can click on the photo to enlarge. Dane Patterson's (The Biggest Loser) chip ran again this past saturday. I guessed it would be worn in the 10k and the runner would finish in 58:25. Nick guessed it would be the 5k with a time of 24:17. John guessed it would be the 5k with a time of 27:43. Karen was just 13 seconds slower than I predicted. This was a doubleheader weekend. Yesterday was the Ostrich Festival 5k and today was a 3.8 miler at a movie studio. Old Tucson Studios is know for being a filming site for many a John Wayne movie, as well as, many other westerns. Here's just a few movies made there. It was almost a 2 hour drive for me. My kids and wife passed at the chance to get up at 4 am. The question was, would I be dead by the time I got to Tucson? I ran again in "A Shirt That Races". Look familiar? This is one of the sets that we ran past. My legs felt great and I was ready to run, but not as fast as yesterday. One, it's my first trail race with a lot of single track. Two, I brought my camera. The race director, who was pretty funny told us it was around 3.9 miles, unless you get lost. This race had lots of turns, as you can see on the map. One loop around the studio streets, then out into the desert, past the start line with a final loop around town. He warned us about rattlesnakes. He said, "the first runner scares the snake, the snake scares the second runner and the third runner gets bit. So make sure you're the fourth runner." Or something to that effect. I was running and taking pictures and ran mile splits of around 11 minutes each for the first three. The final .8 was in town and I had already taken pictures there, so I ran my fastest. a 9:48 mile split. I finished in 41:27 and was happy with that. This was put on by the Southern Arizona Roadrunners (which I am now a member) and they had a great awards ceremony. Lots of door prizes for adults and kids, AG awards and the Old Tucson Sheriff added some levity. We had a trail breakfast (scrambled egg burritos). Here we are running the streets and below is Horse Poop Alley. Yeah, it's where they dump the waste and we got to run right thru it. Old Tucson Studios is in the Saguaro National Forest. SA-war-o. And it is a forest, as you can see. The drive is majestic. Now, it's time to send "A Shirt That Races" to another state. Our goal is to have a different runner in all 50 states and Canada run in this shirt. I'll write on the shirt about the two AZ races, wash it (promise) and then mail it to . . . you? If you want to participate, let Nikemom know when and she'll put you on the calendar. Today was the debut of the men's version of "A Shirt That Races". I set my alarm for 6 am and woke up at 6:30 wondering why the alarm didn't go off. I was ok, since this year's Ostrich Festival 5k was being run on the parade route in downtown Chandler for the first time. Just a few minutes from home. I got to packet picket up an hour before race time. Picked up my race tee, which is just the festival tee. But, still good looking and went back to my car to stay warm. There I am in "A Shirt That Races" with bib #149. It's a small race with less than 200 runners. About 50 degrees and sunny. There was a delay of almost 1/2 hour because the barricade guys slept in. Runners started warming up. This guy wasn't going 15 mph, but I thought it was a funny picture anyway. I started out fast. My plan was to stay around a 9:09 mile. * Three of those plus a fast sprint at the end will give me a PR of around 28:10. My first mile was in 8:45. I thought I was moving pretty good, but there were still plenty of people gliding past me. This course is made for PRs. It's flat and straight. It all takes place on Arizona Avenue with just two turn arounds. Mile two was done in 9:36. I did walk for a drink and to down half a candy bar (much more enjoyable than a GU). Mile three was the most fun. In the finish line picture below you'll see a little kid sitting on the curb. He ran the race. Maybe 10 years old. He cruises past me, looks up, smiles and says hi. I catch up to him, thinking that he's running a 1 mile fun run and it happens to be on the same course. So, I ask. Nope, he's running the whole 5k and it doesn't look like it's fazing him one bit. Yeah, that little kid on the left. Maybe, he's 7 or 8. So we get to the 2.6 mile turn around and theirs a cop directing traffic. I tell the kid to give the cop a high five and he does. As he does I take the turn and say, "see ya kid, I'm in front". As the kid sprints past me, he says, "Oh no your not". We spend the last bit of the race running side by side and I give him some race advice about conserving energy and saving it for the sprint to win at the end. We match stride for stride and then I tell him at the light I'm going to start my sprint. 100 yards to go and we both kick it up a notch. I did mile three in 9:51, but now the kid and I are under a 7 minute pace. I had some gas in the tank, he was running on fumes. I could have taken the kid, honest. Of course, he probably told his dad he didn't want to beat the old man too bad, so he coasted. But, I like my story better. We both finished around 28:52. The kid won by a nose. I stop my garmin, give the kid a fist bump and realize that I missed my PR by 3 seconds. Three Seconds! That's ok. I enjoyed racing with the kid, much more than any PR. There's always tomorrow. Speaking of tomorrow. I hope I have the horsepower for race #2 this weekend. Yeah, I'm taking "A Shirt That Races" down to Tucson for a special race. *9:09 pace per mile would give me a 2 hour HM or a 4 hour marathon. That's why my blog is named after my goal pace. I'm a long way from my goal. My first 15 books in my quest to read 48 books before I turn 48. I'm 15 weeks into the goal and I'm on a one book a week pace. Running, history and a biography. What more could I want. A great autobiography of one mans journey from Japan to South America to an internment camp in the US. This is full of history tha you can't get in a textbook. You might have know about the iternment camps for the Japanese during WWII, but did you know we arrested Japanese citizens in central and South America and interned them? Enjoyed the book and it all made sense, but I can't stick with weight training like I can with running. Loved the book. But, then again I love reading about the Presidents. Whether you voted Obama or not, this is a great read and a very interesting man. An interesting book written before JFK became president. He was recovering from back surgery, was a senator and wrote this book about courageous senators of the past. My father passed this book along to me. Like the Chicken Soup series, it's a collection of warm rememberances of fathers. I, enjoyed reading it. Tim Russert, the author and NBC news fame died while I was reading it. Since I didn't grow up in Indiana, I didn't know how big the high school game was. Sure, I heard about it's popularity. But, until you've experienced it or at least read this book you won't know. I wouldn't have picked it out myself, but my brother in law Doug gave it to me and it's fantastic. A quick, short book of quotes by famous and not so famous people. It was interesting, but I'm glad I didn't buy it. If you are a Chicago sports fan, this is a great book to read. Scott Simon of NPR and NBC fame wrote about his love of Chicago sports from a fans perspective. Great chapters about the Bears Super Bowl win and about the Bulls 6 Championships. This is the first book I've read by John Updike. He passed away a month ago, so I thought I should read some of his works. I think he's best know for the 'rabbit' series. Four books that tell of the life of one Harry Angstrom, a fictional character that was a star basketball player in high school. Updike is a great writer, makes you feel like you are there. Very discriptive. Although the story didn't speak to me, the narrative did. I ordered the second book, Rabbit, Redux from the library and I'll give it a chance too. He calls it the final chapter or what you do to make up for a mistake. He says to do something creative after a goof, so that the client telling about how you screwed up will have to include how you rectified the situation. 14. 50 Things I Love About Japan. It's a short book that was given to me by my mother in law. It's not in GoodReads. A great collection of baseball stories. I love the Chicken Soup series. We can grow lemons in the backyard, but this is what my oranges look like. The can is for reference purposes. Both of those oranges are from the same tree. The small shriveled orange was very bitter. The huge orange had no taste at all and was very dry. We call them the Barry Bonds Oranges. This is the second time I've run this route. I like new places to run and I like this run for a few reasons. Right around the one mile mark I run past a bunch of Orange trees. These are good oranges. They are in the median, so I assume they belong to the HOA. Hopefully, they don't mind if I eat one now and again. Around the 2 mile mark you'll see a series of lakes. If I want to extend this run to 6 or 7 miles, I can run on the trails along the lakes. On the corners before the 3rd and 4th miles are two drugstores. If I need a shot of sugar I can stop at these fuel stations. I did that tonight. I stopped at Walgreens and got a Take Five. A candy bar with pretzels, caramel, peanuts, peanut butter and chocolate. 210 calories. 25 grams of carbs. I try not to eat these too often. But it was good and it gave me the pick up I needed. As you can see on the graph. My splits after the PED -Performance Enhancing Dessert are far better. And to think, baseball wants to ban these. I ended up doing 5 miles in 56 minutes at 8 pm. I was going to run in the afternoon, but it was over 80 degrees. I have it now. The men's version. I'm the first one to wear it, so Arizona is the first state. I plan to run in it this Saturday at the Ostrich Festival 5k. Then I have a surprise for everyone on Sunday. We are still looking for others to wear it in races in all 50 states and in Canada. Are you running a race later in March? If you have a blog and want to wear it, write a race report and mail it to the next runner, you can be a star.